We knew there was a Yahoo group called the Skinnie Winnies and indeed I had visited the site online several times. Then on our return trip from the Good Sam Rally at the Daytona Speedway, we stopped at a gas station for some much needed fuel. No sooner than I had started to fuel, a fellow Winnebago View motorhome pulled in alongside of us. A couple jumped out and started telling us about this Yahoo group and how great it was and that they were having a rally in Feb in Freeport, Fl. They were very enthusiastic and encouraged us to come. We discovered that the rally was being held at the same campground we were at in January for our local club outing. 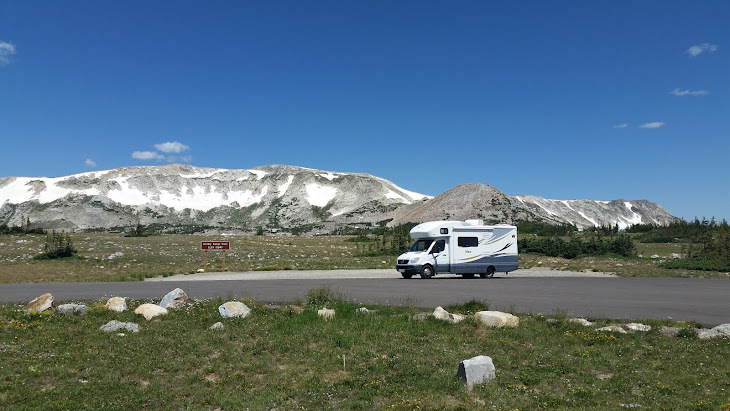 Since we did enjoy the campground and we thought it would be interesting to spend time with others that were owners of the same kind of unit, we decided to go. It turned out to be a great decision. This is a very fun group that was formed on the internet and meets at various places around the country at rallies that our arranged through the Yahoo Group site. We learned that the group started slowly a few years ago, but it has grown quite large. We completely filled the available spaces at this campground. There was approximately 90 people and 45 rigs at the rally. It was really interesting to walk the campground and see row after row of the same kind of motorhome. Many of the group have under taken personalization modifications to their unit. Several days during the rally, these owners opened their rigs to let the rest of us check out what they had done. There was lots of visiting, food and sharing of information over the four days of the rally. Since these rallies are not part of a larger corporate program, they are more informal and spontaneous. We found that there was that additional level of connection just because we had all chosen the same kind of rig. We will definitely be making more of these rallies. I was able to get a nice break from my now near obsession with converting slides into digital picture project by helping with celebrating Victoria's second birthday. It is amazing how fast these two years have gone by. The party was certainly much bigger than any of our girls had for their second birthday. I guess that may come from living in the same place for eight years. They have an extended net work of friends with other small kids. It was a lot of fun, if a bit hectic for some of the older folks in the crowd-that would be me! You can get the feel of it from these few pictures selected from the several hundred that were taken. The last few weeks we have been keeping busy with lots of activities around the house. We have been fortunate to have three couples visit during this time and we really enjoyed each of their visits. We were having so much fun, we failed to get any pictures but hopefully they will come back for a repeat visit and I will have the camera at the ready. I have been keeping myself busy working on a new project of scanning all of my slides and old picture negatives, with the goal of having a completely digital photographic library. This has been a lot of fun and a bit frustrating. The fun part has been remembering times that go back as far as my early childhood up thru the time we started taking exclusively digital photos. The frustrating part has been dealing with non standard slide preparations and trying to correct the ravages of time on the originals. I had done many conversions a few years ago, but the new technology has improved the quality and speed at which it can be done. For this project, I ordered a ION film and slide scanner which makes the process very simple and reasonably fast. Soon I plan on being slide and negative free. I have also spent some time practicing with one of my Christmas presents. I am finally getting the hang of it and enjoy watching Halley bark and growl at the flying object moving around the house. I find it more difficult than flying the real thing. Victoria's second birthday is coming up soon, so we bought her a cute doll house. I thought that my days of actually putting these kinds of things together might be over. However, her mother was worried that she would see it in her house, so the box arrived here for me to assembly. I had some concerns, since I put a doll house together well over thirty years ago that literally had to be built just like a full size house and it took nearly as long as a real one to build. I lucked out and this one took just a couple of hours and no glue. We finished up the last few days , visiting the beach to enjoy the heavy surf which arrived with the latest big front. Our SIL Ryan convinced us we should join a wine club that selects wines from small vineyards that rarely appear in big box wine outlets. After getting two of the standard packages, we felt that they were offering a quality service and we went ahead and ordered some of the special end of year deals. So today we received 27 bottles of wine delivered to our door step! We now can actually say that we have a wine cellar. We are hoping for some more wine loving guests to join us to enjoy the sampling.